So, many of you are still FB loyalists and that's okay. The world won't pass you by yet, but the engines are warming up. To help make your inevitable transition over to Google+, today I will teach you how to create a page, which is similar to a page in FB, except better. Why is it better, you ask? Follow versus like - It sounds the same, but in FB you can only like. When you "like", you will see the comments from that page, or will you? As we know, FB is controlling what people see, and if you are trying to get organic (non-paid) visibility, forget it. I think the last time I saw the stats, maybe 2-3% of the people that have liked your page will actually see your posts. With Google+, when you discover a page you are interested in, you can choose to follow, or even better, you can put that page in a specific category (ie. readers, bloggers, people that like aliens, funny people when I need a laugh) -it's up to you because you can create specific circles to categorize people and places. Control over who sees what posts - As I touched on above, you can categorize people into various circles. If I want to post from my page to bloggers, I can select that group and they are the only ones that will see that particular post. This allows me to duplicate the same post to various communities without making my page look like a repetitive billboard. No ad clutter - This is probably one of my favorite reasons. Refreshingly missing, is the ad clutter when viewers come to your page. There are no accidental clicks taking them away from your page because the click boundary of the ads, is actually larger than the box you see. I am constantly opening stuff by accident that I didn't click on. Google is also not trying to sell their "boost your post" advertising. Enhanced SEO through Google search - If you have a Google page, you are now in the Google system. Your SEO (Search Engine Optimization) will be enhanced within Google search. As I mentioned above, FB buries you if you aren't paying them for "boosting". Google, on the other hand, shines a light on you. For example, if I type "hybrid" into the Google search bar, posts that have been made on Google plus about our book Quest of the Hybrid will show up in the search results. I could conceivably discover more readers if they are searching for hybrid (for cars for example) because my book cover also shows in the search result. I'm not saying I'm going to become a best seller that way, but everything helps. Oh, and nothing shows up from my FB page for Quest of the Hybrid in the same search. 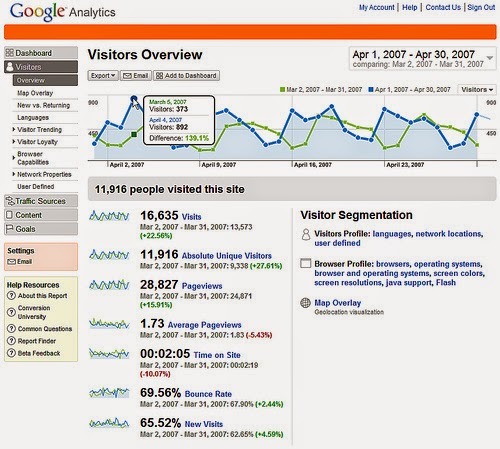 Google Analytics - Now, this is where it gets really exciting! If you have a Google+ page and you also have your own website domain, you can connect them and initiate Google Analytics (GA) on the dashboard of your Google+ page. GA will allow you to track more information on your website than you will ever want to know. The obvious stuff like who is visiting, where they are from, what device they use, how long they stay, etc. You can also create tracking that will allow you to monitor how successful a marketing campaign you have run is. Let's say you have a coupon out for your product, GA can track how many visitors came from that coupon ad and what sites generated the visits and if they made a purchase. You can build customized reports that also interface with the Add-on in the Google Sheets and Docs. We will go into GA much later in this series because I don't want to completely blow your mind yet. That said, there are free training classes offered by Google for those of you that want to dive deep into the trenches. See below for a sample-this is just the visitor overview. It does a "google" other things. Remember, as a kid, what is the largest number? - a google. 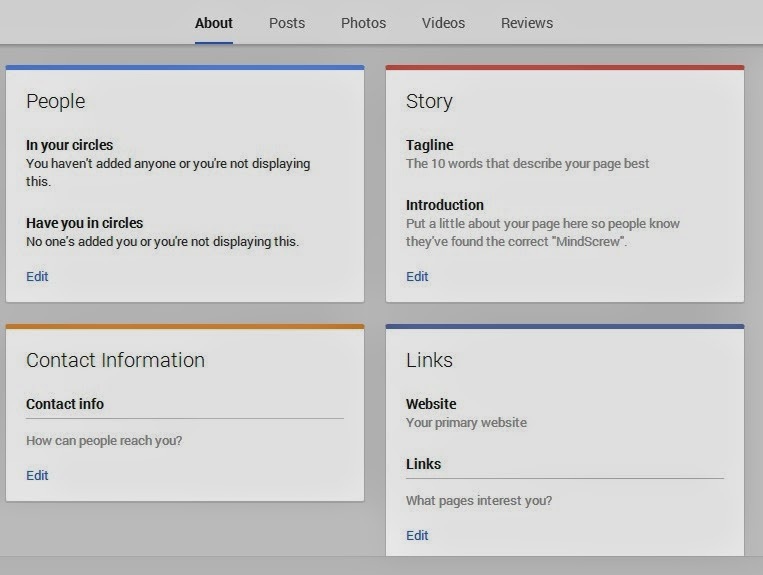 Okay, you sold me...how do I create a page in Google+? Now, to get started, open up the Google+ menu bar on the left. It looks like this. 2. Click on "Get Your Page" and this screen will open up. 3. Select the appropriate business type for your page. Once you do that, another screen will open and ask you to select a name for your page and also add an external website if you have one. Click next and a screen similar to this will appear. 4. Click "edit page". It will open to the "About" section like this (there is a banner at the the top, but wanted to show you the main boxes). Click "edit" in each section to start building your page details. p.s. If you enjoyed this post, please click the +1 button below here, so that others may enjoy it, too!